It’s a special kind of contrarian who can irritate all sides in politics, but then, for all his languor over lunch, Christopher Hitchens is what you’d call an especially contrary fellow. This is a journalist whose meticulously documented contempt for Mother Teresa caused him to be summoned to the Vatican to play devil’s advocate against her memory. He followed that attack with a blast against the cult of Princess Diana which disgusted the Daily Mail. But if these shafts cut through the narrow minds of the Right, Hitchens takes no prisoners on the Left. The oleaginous Gore Vidal has anointed Hitchens his natural heir as Grand Pantomime Dame of the American Left, but his successor has no compunction about dismissing Vidal’s latest political work. "Badly written and ponderously argued," he booms in his rich, bass voice. "I’m not looking for a quarrel with him. I’ve tried to avoid it as long as I could ... "
This counts as a mild assault from Hitchens, whose witty, passionate and bellicose outpourings in the aftermath of 11 September stood out as the finest journalistic response to the terrorist massacres. No-one surpassed him in his assault on al-Qaeda, on "Islam with a fascist face". Equally, many on the Left were numbed by his fierce contempt for appeasers in the war against terror. Even now his enemies are forced to fight a rearguard action. Two weeks ago, the 53-year-old Hitchens was labelled "the poster boy of ‘principled opposition’" by the New Statesman, and derided as the "dishonourable policeman of the Left". His response was to invite the author, Scott Lucas, to "look me up in Washington any time - I am in the book - and have an unscripted exchange with neutral witnesses present". These days, as George Orwell’s centennial approaches, it is almost inevitable that Hitchens is compared to his literary hero, whose ambivalence to parties and ideologies he has himself adopted ever since he left the International Socialists in 1975. In a fine London restaurant, it is easy enough to conjure up some clear distinctions between the lean, ascetic Orwell of the 1930s and the robust and bibulous Hitchens, who even now is happily ordering us up a second bottle of red wine. But according to "Hitch", the fundamental difference is one of moral and physical courage. Orwell was the self-denying reporter whose journeys into misery still colour our views of the 1930s and 1940s, a fighter in the Spanish Civil War, who took a bullet in the throat. For his part, Hitchens, a witness to the Portuguese revolution in 1974, and a foreign correspondent who has been shot at in the course of duty, was never in such danger. Now in his latest book, Orwell’s Victory, Hitchens has sought to rescue his subject from critics who either claim his legacy or scorn his worth. And while he saves much of his spleen for those on the Left who have cast Orwell as a fellow-traveller with the establishment, Hitchens vigorously slaps down the Right, whenever they stumble into view. Take John Major’s pitiful attempt to link "Eric Blair’s" 1984 with the "doublethink" of one Tony Blair. Hitchens was on it like a flash. "I was delighted when I discovered Major had linked the two Blairs. If he’d have read a word of Orwell, he would have known the huge snorting pig in Animal Farm is called Major. But I felt I shouldn’t point it out - it does Mr Major too much credit." He lets go a throaty chuckle: "Old Major is a fine old pig, rallying the piglets for a struggle." In contrast to the last prime minister, Hitchens appears well-disposed to Tony Blair, although he says he deplores his "official piety". He applauds the constitutional changes of the past five years and approves of British foreign policy in Bosnia, Sierra Leone and Afghanistan, contrasting it with the failures of the Bush administration. And despite barbs to the contrary from his left-wing critics, he does not bury criticism of Bush, not least because he fears the struggle they have embarked upon may not go well. Therefore, "It matters to point out when they mess up. I wrote a long piece from Kashmir last autumn saying we should worry about the next war. "America has already committed itself to getting things wrong in Kashmir and Pakistan, for it has for so long neglected the idea of India." 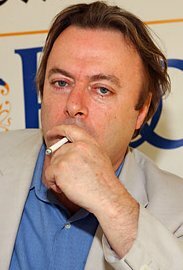 This international outlook has been a constant in Hitchens adult life and he has spent the past 25 years in America ("I felt early on I’d been born in the wrong country," he grunts through a glass of Macallan). The son of an English naval commander, who had worked his way up through the ranks, he was brought up by his mother as the family moved from base to base. She nurtured his love of books before he was sent away to a Methodist boarding school near Cambridge. By the time he went up to Oxford, Hitchens had dabbled with verse, and thought about writing fiction, but found he couldn’t. At Balliol College he shared rooms with the poet James Fenton. He went on to become friends with novelists Martin Amis and Ian McEwan. Very quickly it became apparent he could learn about writing just by spending time with his companions. Thirty years on, would he accept that journalism is the lesser art? The question is posed three times before he answers head-on. "I would rather put it like this. I think the ability to write a novel or a sonnet is a superior ability. James, Martin and Ian have all written essays and reviews which would stand comparison with anybody’s. "That is their spare-time work but it’s not their calling. They knew something that I didn’t know. "I have to say journalism is second-best. It’s not false modesty. I have one idiom in which I can write - James has three. "Gore Vidal has made political writing an art by fictionalising it, but you can’t keep it in the form it commonly exists in and claim it for art," Hitchens says. But with all the fire and humour, the angst and aggression that marked his work after 11 September, surely there’s artfulness to be had from that kind of journalism? "But you’re not going to remember it like Mozart, are you?" He counters. "You must realise, at whatever cost to yourself and however much you think you’ve seen, that you have to be able to recognise a new situation when it happens. "One of my main criticisms of people on the Left like Noam Chomsky and JohnPilger after 11 September was they thought: ‘Here’s a new event, but it just reminds me of what I was going to say anyway and what I’ve been saying all along.’ That was their failure." We are back to the events which could come to define his career, just as they immediately rearranged his priorities. On 10 September it seemed a Hitchens sponsored campaign to have Henry Kissinger indicted for war crimes was coming to fruition. That day, a group of Chileans had been given leave to bring a lawsuit for murder against Kissinger, and others, for their role in the 1973 coup in the country. The same evening Hitchens delivered a triumphal lecture at Washington State University and, to a standing ovation, concluded: "This day will be remembered for a long time in the struggle for justice." He awoke the next day to find the world falling apart on his television screen. The Evening Standard rang, and Hitchens responded instantaneously with the first of a sequence of articles whose passionate clarity made sense of the shocking, confusing scenes for thousands of readers around the world. "It was one of the most beautiful mornings in the history of the world. But the most perfect crystalline view of Manhattan had suddenly been totally obliterated from the air by this ghastly cloud. I wrote that it was ‘as if Charles Manson had been made God for a day’. If you’ve thought that, you aren’t neutral about things. I dumped my campaign - I don’t think the subject of international human rights will go away, but you’ve got to realise when things have changed." We’re back, more or less where he started, and the question of another whisky is being raised. Does he ever worry he’ll lose his fire? Through a great throaty laugh, he has advice for contrarians everywhere. "If you don’t get up every day whimpering with fear, thinking this is the day they’ll find you out, and say, ‘Well he would say that, wouldn’t he?’ you’re not doing your job. You should be in a state of permanent fear about being discovered as a blowhard, or as an irrelevance." He decides against the whisky, because the BBC are waiting to speak to him. A blowhard, perhaps, but he’s not an irrelevance yet. Orwell’s Victory is published by Penguin, £9.99.